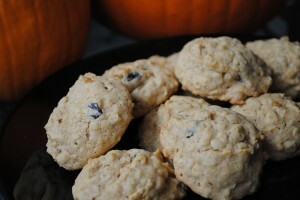 These are the ultimate fall cookie! Lightly spiced and soft, my kids gobbled them up happily 🙂 Not only were they easy to make, but the recipe (which I found on Allrecipes.com) made a ton of cookies. They froze well and were a delicious addition to school lunches this past week. Preheat oven to 350°F Combine the flour, oats, baking soda, cinnamon and salt; set aside. In a large bowl, cream together the butter, brown sugar and white sugar until smooth. Beat in the egg and vanilla then stir in the pumpkin puree. Gradually stir in the dry ingredients until well blended. Mix in raisins. Drop by rounded spoonfuls onto un-greased cookie sheets. Bake for 10 to 12 minutes in the preheated oven. Allow cookies to cool on baking sheet for 5 minutes before removing to a wire rack to cool completely. These sound good…and somewhat healthy! What sized can of pumpkin did you use…the big one or the little one? These were fabulous, and disappeared from the cookie jar VERY quickly! I substituted mashed butternut squash for the pumpkin puree, and added in some dried cranberries, and it turned out well. These cookies are so light and airy that they just seem to melt in your mouth. This recipe is the most simple of all that I seen. I will try to do this tomorrow. I totally agree that this is great to put in kids lunchboxes. I think even if this recipe makes more cookies my kids will surely finished eating it all by just a few moments. Lol. They really love cookies. Pumpkin cookies those are perfect! Perfect since my pumpkin that produced by my pumpkin plant is ready for some recipes maybe some pumpkin soup plus the cookies. Thanks for sharing this recipe of yours.